Filtered water, cashews, turmeric juice, maple syrup, lemon juice, pink salt, cinnamon, cardamom. 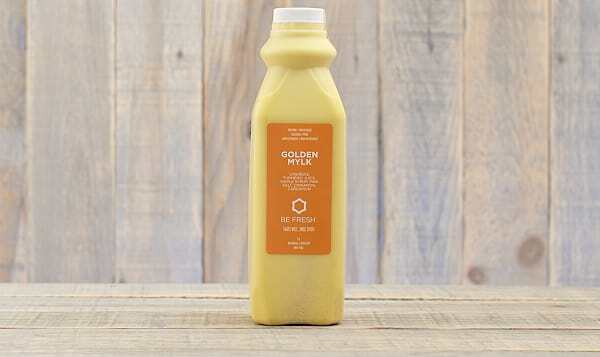 Our version of the traditional Ayurvedic beverage, this creamy, smooth golden mylk is made of just 8 ingredients, including fresh turmeric juice, cashews, and maple syrup. Enjoy it's velvety deliciousness hot or cold, day or night - whenever you need a turmeric boost. Please note that this is a fresh product, so please consume as per expiry date. The Juice Box mission is simple—to give each and every person tools and resource to cleanse and to heal themselves. Juice cleansing is a potent and powerful cleansing system, and these juices are the most nutritious and healing of the bunch. But it doesn’t end with juice. The Juice Box is committed to providing you education to make the best choices for your body and your lifestyle. By doing this, you can become more empowered in your health and wellness. The Juice Box is built upon a foundation of integrity and dedication to your nutrition and to the health of the planet. They will never compromise those things to make a profit. They believe that everyone should have the resources to make more positive choices regarding their lifestyle, health and wellness. Making a small decision like incorporating fruit and vegetable juice into one’s diet on a regular basis can often be the very thing that triggers a deeper connection to health. They believe that juicing can help people feel better, have more energy, and feel more alive. Willow and Jody work hard to make not only the cleanest but the BEST tasting juice your taste buds have experienced. It’s not just all of that sustainable organic produce, it’s also the love of a dedicated team.